This history is based on information gleaned from various sources, including contemporary numismatic periodicals, auction catalogs, and Society publications. It was first presented to the Society at the January 7th, 1992 meeting, and has since been reformatted, with minor corrections, for presentation on the Internet. For many years the Society's original Proceedings books were lost, but these are now in the Society's possession. They have been invaluable in compiling the present work, and the author is indebted to the unknown individuals whose efforts saved these unique documents from the Wreck of Time. This paper outlines the history of the Society's early days, from its founding in 1878 through its decline and suspension in 1889. Eight men met in Pittsburgh on June 14, 1878 to form the Western Pennsylvania Numismatic Society. The founders were a diverse group, united by a common interest in the study of numismatics. They included three clerks, a salesman, a tobacconist/coin dealer, a painter, a newspaper carrier, and a freshly-graduated college valedictorian and future millionaire. The Society grew rapidly in its early years, and its members were very active. They quickly adopted a Constitution and set of Bylaws, and began forming a numismatic library and coin cabinet. To publicize the hobby of numismatics they set up a Society coin exhibit at the great Pittsburgh Exposition in 1878 and 1879. Souvenir medals were struck in each year to jointly commemorate the Exposition and the founding of WPNS. The Society did not develop in isolation; its members subscribed and contributed to various numismatic periodicals and auction sales from other cities. The Pittsburgh area was no numismatic backwater. There were at least four active coin dealers in Western Pennsylvania, and three of them were WPNS members. The first President of WPNS catalogued a total of 13 sales of numismatic material for auctions held in Pittsburgh. Society members were not without their differences. Disputes large and small arose among the members periodically. Separate incidents led to the expulsion of two of the founding members within a year. In 1882 the Society would expel another founder. Other founders were lost for the more usual reasons: sickness, death, or the lack of time or interest to continue numismatic activity. One founder sold his coin collection in 1879 and resigned from the Society in 1880. Another founder resigned in 1882, apparently to devote more time to his business affairs. The companies he founded made him one of the wealthiest men in the country, providing him the resources to resume his hobby in a big way at a later date. Like this prodigal founder, WPNS itself went through a period of dormancy. Its membership dwindled in the 1880's, and in 1889 the remaining members voted to dissolve the Society. But the fire of numismatics was not extinguished; its embers smoldered through this dark period and after two decades the Western Pennsylvania Numismatic Society was rekindled under its original constitution with several of its old members and founders back in the fold. The Society has continued to this day, its members meeting monthly to share their numismatic knowledge and fellowship. This paper summarizes the history of the first golden age of the Western Pennsylvania Numismatic Society, and is dedicated to the gentlemen who made up its membership through 1889. These men were the pioneers of numismatics in Western Pennsylvania. They blazed a trail still followed by the like-minded travelers of today. The first President of the Society, S.H. Morgan is best known today as Pittsburgh's most prolific 19th-century coin cataloguer. Between March 11, 1879 and July 27, 1881, Morgan authored thirteen auction catlogues for coin sales held in the offices of D.F. Henry at 68 Fifth Avenue in Pittsburgh. Morgan's own coins were in turn auctioned by John Haseltine in January 1880, and by W. E. Woodward in April 1882. Little else is known about Morgan. He may be the Samuel Morgan listed as a tobacconist in the 1878 Pittsburgh city directory. The November 14, 1879 WPNS meeting was held at Morgan's home at Millvale Station, P.R.R. (Pennsylvania Rail Road). The 1880 WPNS Constitution and Bylaws booklet lists Morgan's address as Elm Street, Sixteenth Ward. In Woodward's 1882 catalog Morgan is identified as a resident of Louisville, KY.
Morgan was apparently an older gentleman. He had been around numismatics long enough to have the knowledge required to catalogue so many coin sales. He was obviously respected by his fellow founders, who elected him their first President. He had enough free time in 1878 and 1879 to attend each day of the month-long Pittsburgh Expositions. Morgan left Pittsburgh in 1881 and the following year sold his coin collection. All of these facts seem to indicate that Morgan was retired or semi-retired at the time WPNS was organized. The first Vice-President of WPNS, Frank J. Kirk, was part owner of a painting business, Wilson & Kirk, with offices at 84 Fourth Avenue. His home address was 149 Wylie Avenue; this address was listed in the 1880 Constitution booklet. Little else is known about Kirk. His coin collection was catalogued by Morgan in June, 1879. The collection included mainly U.S. coins, plus assorted foreign coins, medals, and some colonial currency. The bulk of the collection consisted of a date set of cents and half cents from 1793 to 1857, plus some varieties. The highlight of the sale was lot 34, a fine 1793 Liberty Cap cent, which brought $9.00. The total sale realized $89.95. Kirk resigned from the Society in December, 1880. He apparently remained in Pittsburgh, since he was still listed in the 1890 city directory. The first Secretary of the Society, George Rode, occupied the position for most of the Society's first eleven years. If any one individual deserves special recognition for service to the Society during its formative years, it is George Rode. Then as now, the Secretary is the workhorse of the Society, writing minutes of every meeting and handling correspondence with other collectors and Societies. As this paper will show, Rode's correspondence on behalf of the Society was extensive. He exchanged letters with the American Numismatic Society in New York, and publicized the Society's formation and activities via the editors of various contemporary numismatic periodicals. Without these precious records, little would be known today of the existence of the band of coin enthusiasts who created the Western Pennsylvania Numismatic Society. Rode is listed as a clerk in the 1878 Pittsburgh city directory, working at 49 Fifth Avenue. It is not known what type of business Rode was in. This work address is where Rode received his numismatic correspondence, and is the address listed in the 1880 Constitution booklet. By 1899 Rode was listed as a cashier at 255 Fifth Avenue, living at 38 Hazelwood Avenue. Rode became charter member number 12 of the American Numismatic Association, and was nominated by founder George Heath to serve on the organization's "Board of Temporary Organization." Rode also served as the A.N.A. 's Superintendent of Exchange in 1891-1892. At the October 1, 1892 A.N.A. Convention in Pittsburgh, he served as Secretary. Elbert F. Maynard was the Society's first Treasurer. He had several occupations over the years. In the year of the Society's founding, he was listed as a clerk at 148 Third Avenue. His address as listed in the 1880 Constitution booklet was a post office box. By 1890 Maynard was listed in the Pittsburgh city directory as the proprietor of Hotel Crescent at 16 Smithfield Street. By 1899 he was listed as a salesman at 717 Liberty Avenue, making his home on Ridge Avenue in Allegeny. Robert W. Shipman probably qualifies as the earliest known coin cataloger in Western Pennsylvania. He cataloged a 12-page, 359-lot sale for the D. F. Henry auction house on January 28th, 1879 (two months before Morgan's first sale). The sale contained ancient Roman coins, U.S. coins and medals, and foreign coins including siege pieces. This is the only sale known to be cataloged by Shipman. He was later a charter member of the A.N.A. (member #79). Little is known about Henry McKnight. He is listed as a clerk in the 1878 Pittsburgh city directory. Elected Treasurer of WPNS in June 1882, he also took over as Secretary when George Rode resigned the position on March 2, 1883. At the June 1883 business meeting he was offically elected to both positions. Rode returned to the Secretary's position in 1884. McKnight served as curator from June 1886 until the Society's dissolution in 1889. He also became a charter member of the A.N.A. (member #51), and presided over the A.N.A. 's October 1, 1892 Convention in Pittsburgh. John Rivett was the son of Eliza and Nathaniel Rivett, who ran a news depot as early as 1860 at 709 Penn Avenue. In 1878 Nathaniel ran a variety store at 625 Penn Avenue. There is no listing for John Rivett that year, but it is assumed he worked at the family store. By 1890 Nathaniel and John were listed as "paper carriers" at 6021 Rodman Street in East Liberty. By 1890 his father had passed away, and John was listed as a "circulator" at the home he shared with his mother at 315 N. Sheridan Avenue. At the age of 19, Clapp was probably the youngest of the eight founders, having just graduated from college in 1877. He had attended the Western University of Pennsylvania, (later renamed the University of Pittsburgh). His scholarship and talents were well-recognized at the time: Clapp graduated first in his class and delivered the commencement address. An enterprising lad, he had made an arrangement with the keeper of a nearby toll bridge to search his till for strange coins and old coppers. We can only wonder today if his fellow WPNS founders realized the extent to which Clapp would succeed in his later endeavors in numismatics, science, and business. Born on December 14, 1858 in Allegheny City, Clapp developed an early interest in science. As a young man he worked for several years in the machine shop of the Penn Cotton Mill, then became a chemist at the Black Diamond Steel Works. There he became an assistant to Capt. Alfred E. Hunt, a metallurgist of note, who was just three years older than Clapp. In 1883 the two set out on their own, forming Hunt & Clapp, a firm of consulting engineers. In 1888 the men met Charles Martin Hall, a young inventor who had recently discovered an electrolytic process for reducing aluminum. Previous methods of extracting aluminum from ore were very expensive, and the two were quick to realize the tremendous potential of Hall's process. With friends, they formed the Pittsburgh Reduction Company, which later became the Aluminum Corporation of America (ALCOA). Clapp served the corporation for many years as its Treasurer, Secretary, Vice President, and member of the Board of Directors. The original Hunt & Clapp partnership became the Pittsburgh Testing Laboratory, where Clapp served as president. Clapp was also the first president of the firm which became Fischer Scientific Corporation. All three companies are still very much in business today. He also served at times as a director of the Reliance Life Insurance Company and the Farmer's National Bank of Pittsburgh. He was a member of the Board of Trustees of the Carnegie Museum of Natural History from 1909 until his death forty years later. In addition to his numismatic interests Clapp was an accomplished conchologist (a student of shells). His collection of 150,000 items was donated to the Carnegie Museum. Clapp became the oldest living alumnus of the University of Pittsburgh, and he made many generous contributions to its growth. He served as President of its Board of Trustees for 47 years. Clapp Hall, a science building, was erected on the campus in his honor. He made his home at 145 Woodland Road in Edgeworth, and maintained a summer residence at Kennebunkport, Maine. He passed away on March 31, 1949 at the age of ninety. Clapp will be forever known in numismatic circles for his extensive contributions to the study of Early American Coppers. His detailed studies of die varieties on early cents were incorporated into the classic reference, Early American Cents, published by William Sheldon in 1949. Clapp's own work was made available previously in his self-published 1931 work, The United States Cents of the Years 1798-1799, and his 1947 collaboration with Howard Newcomb, The United States Cents of the Years 1795-1796, 1797, and 1800. In the early years of WPNS, meetings were held weekly. At the first organizational meeting on June 14, 1878, it was resolved "that Friday be adopted as the regular meeting night." The first Bylaws formalized this arrangement, stating that "the regular meetings shall be held every Friday night at 8 o'clock P.M." The location of these first meetings is unknown, but it is likely that they took place in downtown Pittsburgh. On occasion, the Society met at the home of a member. The first of these special meetings took place on November 1, 1878, at the "residence of President Morgan, Millvale Station P.R.R." The town of Millvale is now part of the City of Pittsburgh, across the Allegheny River about 5 miles upstream from The Point. Perhaps members travelled to the meeting aboard passenger trains of the Pennsylvania Rail Road. On the following Friday (November 8) the Society convened at the home of E. F. Maynard. On November 29th and December 20th the Society was hosted by F. J. Kirk. 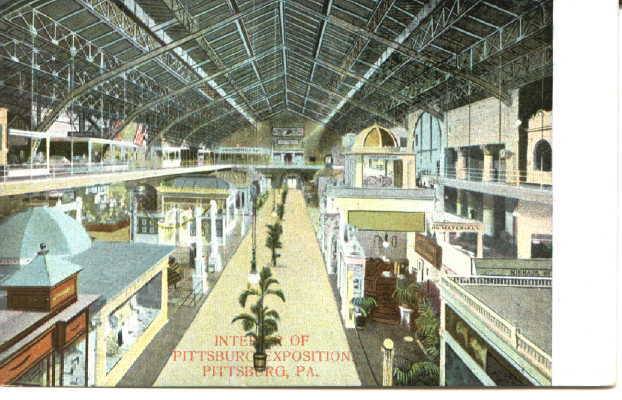 Two special meetings were held at the Pittsburgh Exposition Society buildings on September 4th and 20th. Throughout 1878 the eight founders continued to meet as scheduled. George Rode and F. J. Kirk were present at every meeting, and S. H. Morgan missed just one. The typical meeting consisted of six of the eight founding members. Clapp was absent the entire summer. He attended for the first time on August 30th, but was a regular for the remainder of the year. The Society shall be known as "The Western Pennsylvania Numismatic Society"
1st. For the purpose of exchanging views on the different Coins and Medals of the United States and foreign countries. 2nd. The improvement of our minds on Numismatics. 3rd. The formation of a Library and Cabinet relating to the study of the same. The officers of this Society shall be a President, Vice President, Secretary, and Treasurer. The officers shall be elected at the last meeting in June. They shall hold office for one (1) year from the first day of July, following. The dues shall be Twenty-five (25) Cents a month. Any member who is indebted to the Society for more than three (3) months dues, shall be suspended until all his dues have been paid. The Society shall not be dissolved as long as five (5) members remain, except with the consent of all the members. The first item of Society business following the organizational issues was to purchase and auction a collection of coins belonging to one of the members. Apparently this was done as a "fund raiser" for the new organization. The minutes of the June 21st, 1878 meeting record a resolution "that the President be authorized to buy the collection of American Coins from Mr. Maynard for Twenty (20) Dollars. Resolved, that the above collection be sold at auction at the next meeting." On June 28th "Mr. Morgan was appointed auctioneer to sell the collection of Coins bought from Mr. Maynard. The collection was then sold, and the Secretary reported that it brought $33.36." At the following meeting (July 5th) "a warrant was drawn for Twenty (20) Dollars to pay for the coins sold..."
The Society quickly began working toward the goals set out in Article II of their Constitution; the first acquisitions for the Society Library and Coin Cabinet occured in June and July 1878. At the June 28th meeting, "The President reported that he had recieved a copy of the Constitution and By-Laws of the American Numismatic and Archaeological Society and donated the same to the Society." At the same meeting the Secretary was instructed to "subscribe for one (1) year to the American Journal of Numismatics." A warrant in the amount of $2.00 was drawn to pay for the subscription. At the July 5th meeting it was resolved that "the Society purchase a proof set of 1878 (minus the 20c piece,) for Four Dollars and Fifty Cents ($4.50)..."
The early history of the Western Pennsylvania Numismatic Society is intimately connected with the Pittsburgh Exposition of 1878. WPNS members promoted their Society and the hobby of numismatics via a coin display at the Exposition, and they produced and sold the first WPNS medal in conjuction with the exposition. Sadly, the Exposition was also the backdrop for a disagreement among the members, leading to the expulsion of one of its founding members. 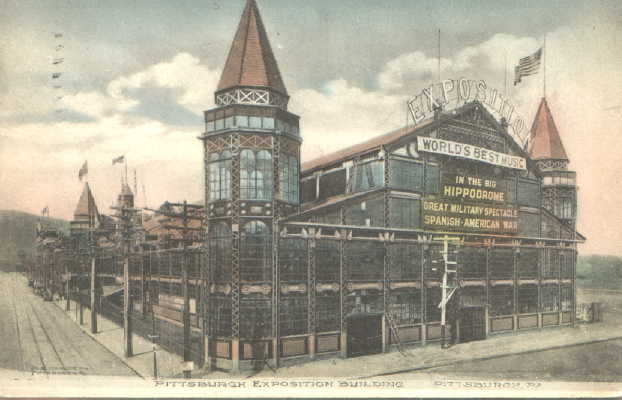 The Pittsburgh Exposition Society was founded in 1875 for the purpose of promoting Pittsburgh products. Much like a World's Fair, several exhibition buildings were erected in Allegheny City. An advertisement in the June 22, 1878 Pittsburgh Commercial Gazette announced that the Exposition would be held from Tuesday, September 3rd through Saturday, October 5th of that year. On July 5th, 1878 a committee consisting of Shipman, Rivett, & Morgan "was appointed to see what arrangement can be made with the Pittsburgh Exposition Society to place a collection of Coins on exhibition at their next Exhibition." The Society's efforts were publicized nationally via an article appearing (belatedly) in the November 1878 issue of the Coin Collector's Journal. Pittsburgh posseses one of the most energetic numismatic societies that we know. Its members are interested in the science and desire to spread a knowledge of it all around, that the pleasure and profit they receive may be known by others. During the present year there is in Pittsburgh an exposition, and the society have wisely siezed the opportunity for awakening an interest in numismatics by placing on exhibition its collection of coins and medals. Thousands will thus learn that there are persons who take a pleasure in the study of coins, many of whom will catch the infection and be led in turn to become centres for awakening an interest in others. Many who know a little about coins, or who having by them a handful of old coppers as curiosities, will be led to looking into them, and may possibly find some rare coins in their little hoard. Such a result will certainly lead to a great increase in the membership of the society, and who knows but that some of these days the society will be showy enough to propose a Numismatic Loan Exhibition to which collectors might go from all parts of the land. We wish the society all success and wish that its activity may never decrease. To commemorate this exhibition of their coins, a white metal die, by Geo. H. Lovett has been issued, having obverse a laurel wreath enclosing the words in three lines, FOUNDED JUNE 14TH, 1878, and outside, running all round, WESTERN PENNSYLVANIA NUMISMATIC SOCIETY, with PITTSBURGH, PA., in the exergue. On the obverse is a view of the Exposition building with PITTSBURGH EXPOSITION SOCIETY above and EXPOSITION of 1878 below. On July 19 the committee reported "that they had secured the exclusive right to sell the medals at 8%, and that they had paid the entrance fee of $5.00." No mention of medals is made earlier in the minutes, but obviously the subject had been discussed. Minutes of the next several meetings state only that the committee "reported progress." "Dr. W. F. Carver, will exhibit his prodigious skill as a rifleman daily, illustrating his marvelous powers by breaking glass balls in the air, cutting coins, lead pencils &c., using a Winchester Rifle." "The Great Automatic Wonder, the German's Dream, consisting of 40 moving and working figures has been secured, and will daily afford an endless fund of delight for old and young. " "The Illuminator of the Future, Electric Lights, will be one of the novel and interesting features of the coming Exposition. The Floral Hall will lighted throughout every evening by this means and will add brilliance to every effect." (Thomas Edison's invention of the electric light bulb occured in 1877, just one year earlier). On Monday evening, September 2nd (the night before the Exposition opening) the Society held a special meeting at the Exposition Building in Allegheny. Present were members Morgan, Maynard, McKnight, Clapp, Shipman, Rivett, Kirk, and Rode, "but owing to the lateness of the evening, no business was transacted." On Wednesday evening, September 4th, another special meeting was held at the Exposition building. The members were present, except for Henry McKnight and John Rivett. The meeting had been called at the request of several members. Mr. Morgan stated the purpose of the meeting to be for the "election of a person to take charge of the collection of coins at the Exposition." Mr. Morgan offered to attend to the collection and sell medals for $1.00 per day; and one half (1/2) of the net profit on all medals sold, after the first two thousand (2000)." The motion passed, and the Society voted to pay John Rivett $5.00 "for his services during the present week." The members also resolved to hold no regular meetings during the term of the Exposition. As Mr. John Rivett has committed an act unworthy of a gentleman by removing his coins and medals from the exposition, where the Society in common had their coins on exhibition, for the reason that the Society did not give him the position in charge of the coins, as they did not think him competent to take charge of and do the business of the Society desired; We, the undersigned members of the Society do hereby deem him unworthy of membership and will vote at the next meeting to expell him from the Society. The letter was signed by Maynard, Clapp, Kirk, and Rode. The next Society meeting did not take place until October 11th, following the close of the Exposition. Mr. Rivett was duly expelled. E.F. Maynard ordered the medals from engraver George H. Lovett on behalf of the Society; Maynard was later reimbursed $85.00 for the dies and planchets. Medals sold at the exposition were in white metal. The Carnegie Museum of Natural History owns a white metal specimen of the medal which has apparently been shot through with a bullet. Evidently this piece is evidence of Dr. Carver's sharpshooting talents. It is not known how many were struck or how much they were sold for at the Exposition. However, total sales of $138.30 were reported on October 11th. The minutes also note that 22 medals were on hand at that time. If the medals were priced at 15 cents, then 922 were sold. If they were sold at just 5 cents, then 2,766 were sold. Morgan had requested a share of profits after the first 2,000 medals sold, but this was back at the beginning of the Exposition. The Society resolved to sell the remaining 22 medals for the benefit of the Society at no less than 25 cents each. Also, "Mr. Maynard presented the Society with a silver exposition medal, for which the thanks of the Society were voted." At the September 20th meeting the Secretary had been "instructed to present one of the Society's medals to the various Numismatic Societies; and also to Messrs. Scott & Co. and Geo. H. Lovett, Esq." At the October 18th meeting letters of thanks were read from the Boston Numismatic Society, the American Numismatic and Archaeological Society, and the Numismatic and Antiquarian Society of Philadelphia. On October 25th the Secretary read a letter from Mr. Lovett offering "to strike Copper Exposition Medals for 20cts each, and in Silver for $1.00 each." The Society resolved to make 25 copper medals, 15 brass, and 7 silver. This would make a total of at least 8 silver medals, since Maynard had already donated one to the Society Cabinet. It makes sense that only eight were struck altogether (one for the Society, and one for each of the founders, except Rivett). The Society further resolved that the obverse die be cancelled after the above medals were struck. The medals were recieved by the Society by the November 15th meeting. On November 22nd a letter from Mr. Lovett was read, attesting to the number of medals struck. Secretary Rode reported that the obverse die had been cancelled. The Society did not add its first new member until the last meeting of 1878. Five more members were added in quick succession, bringing the roster to thirteen by the end of January, 1879. The new recruits were as diverse as the founders. Their occupations were notary public, cigar manufacturer, hotel manager, clerk, and jeweler. Edward. G. Comingo was listed as a notary public at 158 Fourth Avenue in the 1878 Pittsburgh city directory. He made his home at Forbes and Dithridge in the 14th Ward (Oakland). Residing at the same address were Isabella Comingo (widow of Henry) and the Rev. Neville B.C. Comingo. The July 17, 1878 Pittsburgh Commercial Gazette reported that Comingo's home had been burglarized the previous month. Wm Cella is charged before Alderman Reilly with breaking and entering into the house of E. G. Comingo, Esq. at Bellefield on the 29th ult., and feloniously appropriating a gold watch and other articles of jewelry to the value of $125. The accused was arrested and jailed for a hearing tomorrow. A cigar manufacturer, Ferdinand Sermin was listed in the Pittsburgh city directory as early as 1860, doing business at 423 Liberty Avenue. In 1878 the directory lists his business as "cigars and tobacco" at 416 Forbes. Sermin was still active in his business as late as 1890, where he was listed at 496 Forbes. Working at the same address was Fred Sermin, a clerk (probably Ferdinand's son). Sermin was elected Treasurer of WPNS in June 1883, and was re-elected to the position each following year through 1889. Virtually nothing is known of William R. Haslett. There are three different W. Hazletts listed in the 1878 city directory. In 1890 there are two William R. Hasletts, one employed at the Pittsburgh Label Company. J.E.H. Kelley was the manager of the Monongahela House hotel at Smithfield and Water streets (now Ft. Pitt Blvd) by 1890. He was not listed in the 1878 city directories, but the 1880 Constitution lists his address as the Home Hotel, Duquesne Way. The Spetember, 1879 issue of Mason's Coin Collector's Herald lists Kelley as a subscriber, along with George Rode, Major C. P. Nichols, the "Western Numismatic Society", William Poillon, Robert Coulton Davis, R. W. Zabriskie, and 50 other pioneering numismatists. A. Charles Gies was a jeweler and optician, who began collecting coins in 1864. He was not listed in the 1878 city directory, but appears in the 1890 directory at 52 Frankstown Ave. He later moved his business to 6260 Frankstown Avenue. In a letter contained in the WPNS archives, he recalled the beginnings of his collection of "the war tokens and store cards of Pittsburgh." Gies stated that he "started to collect these momentoes of our Early Store Keepers when small change was very scarce. I knew where all these stores were. (I) was in some of them when I was a boy, and in after years got acquainted with some of those that issued these coins during the period of the Civil War, among which I mention Mr. Buffum." Gies had built a collection of 95 varieties of Pittsburgh Civil War store cards in copper, brass, white metal, nickel, and paper. Gies was elected a trustee of the A.N.A. in 1904. He attended the Chapman's Stickney sale in Philadelphia (June 25-29, 1907), taking a trolley excursion to Fairmont Park one evening with Dr. Louis Comparette of the Philadelphia Mint, Virgil Brand, Ben Green, Thomas Elder, Edgar H. Adams, Farran Zerbe, and others. In September of that year Gies joined 27 fellow numismatists for the A.N.A. Convention in Columbus, Ohio. He is pictured in the front row of the official convention photograph, along with Heath, Zerbe, Green, Elder, and S.H. & H. Chapman. Gies brought with him an 1816 half dollar, which he sold at the convention. It was reported in the October 1911 Numismatist that while on a trip through the Rocky Mountains Gies acquired an 1861 Parsons & Company $5.00 gold piece (only 4-6 pieces are known today). Gies collected all U.S. coins, but specialized in half dollars, discovering many die varieties not listed in the standard reference of the day, the Haseltine Type Table catalogue. As reported in The Numismatist, Gies attended the 1924 Cleveland A.N.A. convention, where he and fellow Pittsburghers (and WPNS members) Gottlieb Kraft and Perley W. Locker "were inseperable conventionites. They are a long-time friendly trio of rivals for die varieties of the early United States half dollars. What they did not have on public display they had to show in private. Based on their combined table of varieties, a new 'type table' is in order." George Clapp, in a letter to the Society written July 2, 1938 (in response to a letter notifying Clapp of his nomination as an Honorary member) stated "this is an unexpected honor and while I am the only living "Charter Member" I feel that the honor should have gone to "Charlie" Gies, the man who has held the Society together, and done the real work, in doing so, these past sixty years." At the time his half dollar collection was auctioned by Stack's in 1940, Gies was the oldest living collector in the United States.